Marquee Studio's Photo Booth is available as an add-on for your wedding or special event coverage. Your photo booth is setup and managed by one of our photo booth attendants. Your attendant will ensure that everything is working correctly, is clean, and ready to go at the start of your party. In addition to your photo booth setup, your attendant will have a table full of fun props for your guests to use. Throughout your wedding or special event, our photo booth attendant retains a print copy of the photos taken in your booth. 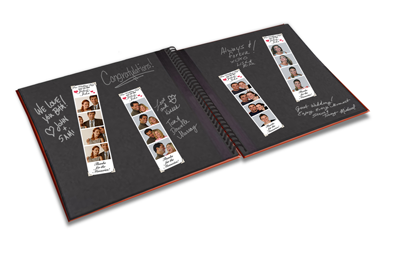 At the end of your party, you will be handed a scrap book with a copy of your images and optional personal messages written by your guests. Every image and video message taken in your booth is saved and added to a USB stick by the photo booth attendant. The photo booth attendant will then provide you with your USB stick at the end of your wedding or special event.